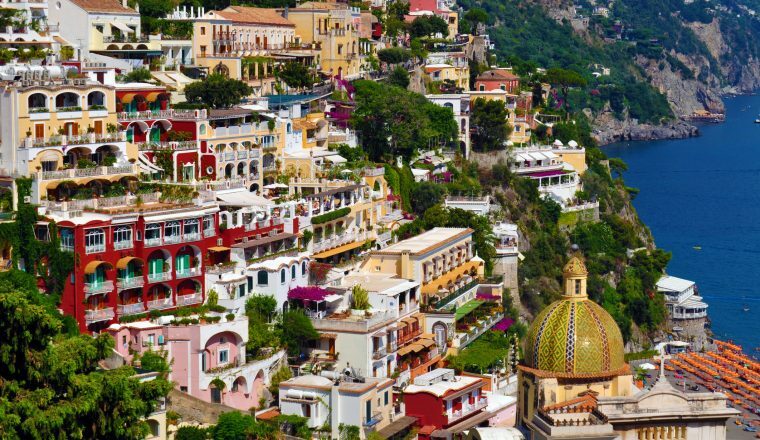 This holiday concentrates on the area around the towns of Amalfi and Positano, staying in small hotels and B and Bs. Seven nights with six days walking will take you to Ravello, Amalfi, Positano, Bomerano and Praiano, staying in three different centres. A self-guided walking holiday along one of the most spectacular coastlines in Europe. Wonderful views throughout, and fabulous scenery. This holiday concentrates on the area around the towns of Amalfi and Positano, staying in small hotels and B and Bs. Seven nights with six days walking will take you to Ravello, Amalfi, Positano, Bomerano and Praiano, staying in three different centres. This is a very good value holiday in an expensive part of Italy. Optional extension to Capri. Upgraded hotel in Capri possible – please give dates and we will let you have the additional cost. March to November on date of your choice subject to accommodation availability. Today’s walk brings you towards the highest peaks of the Amalfi Coast, with fabulous views. Pass through vineyards and chestnut woods, climbing for an hour to reach the ridge of the Monte Tre Calli, from where there are 360 degree views. Along the ridge walk on to a natural rock formation known as the ‘mushroom’, from where you have a choice – continue the climb to the Monte Sant’Angelo, or opt for a relaxed picnic lunch. Descend towards the little chapel of the ‘Virgin of the Silence’, and finally an easy path back to Bomerano.11.5 kms. Approx 5 hours walking. Height gain/loss: 500m. Overnight Agerola. From Bomerano walk down to the Praia Valley,a wonderful landscape of sheer mountain cliffs and terraced vineyards. Reach a grotto with medieval frescoes then descend to the fjord Furore,with its towering limestone cliffs. From the village of San Lazzaro enjoy one of the finest panoramas in the area. Arrive at Vettica fromwhere you have the option to continue on foot to Amalfi or walk to thecoast and make a short transfer to Amalfi by local boat. 10 to 13 kms.5 to 6 hours. (3-4.5 hours walking).Overnight Amalfi. Departure after breakfast An extra night in a hotel can be booked upon request. Nearest airport Naples: From the airport take shuttle bus to Sorrento and get off the bus at Castellamare. From Naples station there is a train service to Castellamare. An inexpensive local transfer can be booked from here (paid locally) or continue by local bus. A private transfer can be arranged on request. Return by boat or bus to Sorrento and then train to Naples (or if going to the airport shuttle bus direct from Sorrento to Naples Airport.